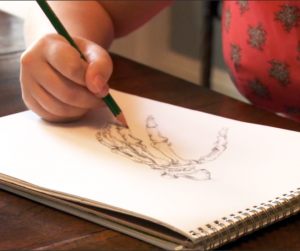 Alabama Public Television profiled UA art alumna Lindsay Jones Lindsey in a mini-documentary on American Graduate Day. The video aired Saturday, Oct. 3rd as a part of APT’s American Graduate: Let’s Make it Happen program. Lindsey graduated in 2012 from The University of Alabama with a BA major in art (concentration in sculpture), and a triple minor in biology, Computer-Based Honors and the Blount Undergraduate Initiative. She is currently enrolled in medical school at the University of South Alabama College of Medicine and is scheduled to graduate in May of 2018. She has narrowed down her specialty choices to three: plastic/reconstructive surgery, trauma surgery and emergency medicine. Lindsey has always been a visual thinker, she said, and The University of Alabama was “gung ho” about her career plans when she interviewed here for college. Early in her college education, she combined sculpture, anatomy and medical education in a “summer shadowing experience” with reconstructive surgeon (and UA alumnus) Dr. Gaylon McCollough. Inspired by her experiences with Dr. McCollough, she created a bronze bust of a woman’s face with one side of the face exposed to show the bone and muscle anatomy. 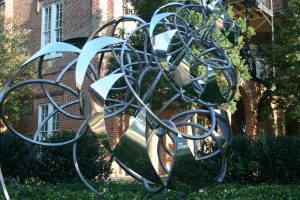 A class collaborative lighting project, Light as Material, resulted in Lindsey’s Fibonacci Project and her large-scale steel sculpture in the Woods Quad Sculpture Garden. In the fall of 2013, under the direction of associate professor of art Craig Wedderspoon, arts technicians Patrick O’Sullivan and Mike Eddins and art students erected Lindsey’s sculpture in its current home in the northwest corner of Woods Quad. See images of Lindsey’s sculpture on Flickr.com. Through the American Graduate: Let’s Make it Happen program, APT and its local partners support community-based solutions to the dropout crisis and promote high school graduation in Alabama.